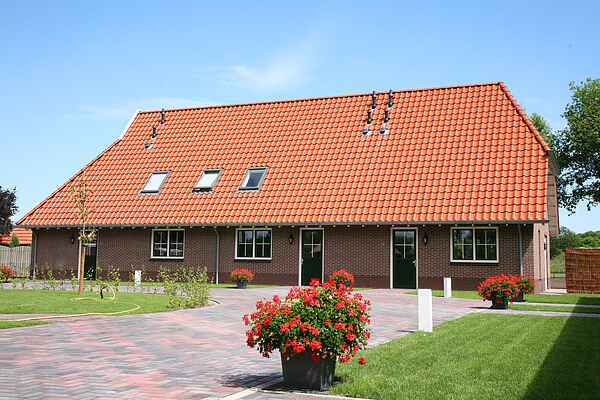 This rurally located accommodation for 10 people in Enter (Overijssel)is the perfect place to come and stay together. The farm is built in the Saxon style, is comfortably furnished and equipped with all luxury conveniences. From your living room, through the French doors, you can enjoy the terrace in the garden from which you can look out over the Twente countryside. The farm has a bedroom with an attached bathroom on the ground floor. The other bedroom are located on the first floor and are all equipped with 2 single box spring beds for optimal sleeping comfort and spacious closet with hangers and shelves for your clothes. Service and enjoyment are of paramount importance at this holiday estate. Upon arrival, a delicious cup of coffee is ready for you. It's particularly fun for children here at the petting zoo, on the mini-golf course or at the playground (facilities cost extra). The environment also has a lot to offer; Twente offers peace, beautiful nature and cultural heritage. For example, visit the cities of Almelo, Hengelo or Enschede. The various cycling and walking tours take you through the beautiful scenic landscape. Children can have fun at Hellendoorn Adventure Park and Ponypark Slagharen. In short, it is an ideal holiday destination!